Bersekers appear to be a stronger version of the common Viking Infantry and Normans. They are faster, have better defence and more health, but don't have throwing axes. They usually appear in groups of 2, 4 or 5, occasionally in greater groups like 8 or more. 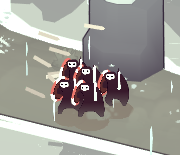 These troops are far more aggressive, ignoring your buildings in order to chase down your soldiers. A stronger version of the Viking Infantry and Normans. As of version 1.5, they can tank hits the same way as Viking Brutes. Due to their speed, numbers, shields and health, they are the best at overwhelming your pikeblocks frontally. They are stronger than Veteran Infantry. Resistant against level 1 Plunge, Volley, and Pike Charge. Can't block ranged attacks when engaged in melee combat. Pikes and choke-points are the most effective against them. They ignore your houses and attack your troops, so you can bait them to the best choke-points on the island. If all your troops are Replenishing, berserkers will just stand still and wait for them to come out. You can rescue a unit from berserkers by going into a house to Replenish.